A World War II bomber pilot, Davis renounced his American citizenship in 1948, declaring himself a "citizen of the world." He explained that he was motivated by his involvement in the mass destruction wrought by nation-states for the second time in 20 years. Humanity itself could be destroyed in a third world war, Davis warned, arguing that only through global government would world peace be possible. Kanegis, who has made documentaries about nuclear weapons, says he became intrigued by Davis' story "because most other stories are about all that's wrong with the world." 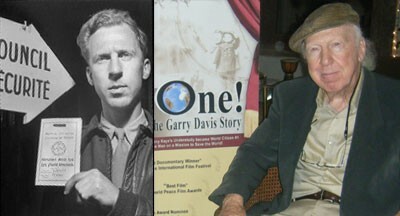 The Davis film, he adds, "is looking at how to fix the world." Davis, who will turn 92 next month, moved to Burlington about 25 years ago. The World Service Authority, the administrative arm of the World Government of World Citizens, operated for a time from an office above Leunig's Bistro on the Church Street Marketplace. Davis acted globally and thought locally. Two years after embarking on the film project, Kanegis says he's "very pleased and proud to be involved in it." With the support of some "generous donors," the movie should be finished in time for showing at the Toronto Film Festival in September, Kanegis adds. He declines to estimate the cost of what is projected to be a 77-minute documentary. Davis is expected to attend the showing along with Kanegis, who plans to incorporate audience responses on Friday into the final product. The screening takes place at 6:30 p.m. at 294 North Winooski Avenue.